Genuine gemstone rings in gold, white gold, and sterling silver. Are you a cool aquamarine, a rich, traditional emerald or a fiery ruby? 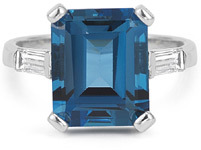 Choose a gemstone ring with a birthstone, or gem that holds special meaning. These rings in gold, white gold or .925 sterling silver let you use a little creativity to give that special someone (or yourself!) a piece they to cherish. One of the features of gemstone rings is the personality each one possesses�each shows off its own meaning and style. When buying a ring for someone special, each unique jewelry piece captures the style and personality of both the buyer and the recipient depending on the gemstone and style chosen. Read more. 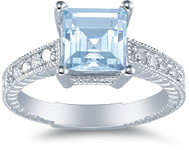 For most, the idea of jewelry and gemstone rings brings to mind the traditional, sparkling, colorless diamond. However, gemstone rings have also held their place as a popular choice over time, though perhaps less noticed than the omnipresent diamond. But the Apples of Gold Jewelry collection of authentic gems is causing buyers to take a second look at the rainbow of rings available to them. 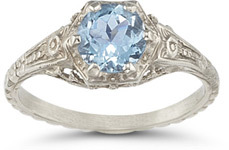 Gemstone rings are not only different and unique, but they also exhibit a vintage and timeless look that never goes out of style. For years this style of ring has gone from being the face of royal engagement rings to personalized gifts for someone special. Apples of Gold has a flourishing selection of beautiful rings that are perfect for any occasion. Whether it is a sparkly gemstone solitaire or a pairing with diamond accents, these rings exhibit a variety certain to suit any style. The colored stones featured in these magnificent pieces also hold Biblical significance. Nearly every stone recognized today as a birthstone makes an appearance in the Bible. In Exodus, these stones adorned the breastplates of the priests serving in the holy, ancient temple. In Revelation, they decorate the walls of the New Jerusalem. These vivacious gemstone rings are more than just a pretty face�they hold an ancient meaning and significance in God�s Holy Word. More than simply a timeless gift, gemstone rings are a unique option for engagement rings as well. Celebrities, as well as royalty often avoid the norm of the traditional colorless diamond ring to get a little adventurous with their wedding jewelry. Rubies and sapphires lead the trend in colored gemstone engagement rings, while other precious stones such as emerald or smoky topaz would make an outstanding ring as well. 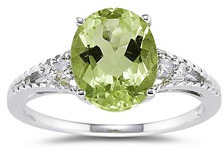 From real peridot to amethyst, engagement ring or birthday present, gemstone rings are a perfect and unique way to show your love for that special someone!